Deities and Demigods is a storied resource book from the first edition of Advanced Dungeons and Dragons: between being copyright trolled by false claims of infringement on the Lovecraft estate (and a more valid copyright claim over the use of Elric of Melnibon mythos), and the general uselessness of gods and demigods to the vast majority of D&D campaigns, and the book's usefulness to nutjobs who claimed that D&D was a trojan horse for occult indoctrination, Deities and Demigods is a title whose reputation redounds even today. Some of that reputation is certainly down to Erol Otus's amazing cover art for the original hardcover, which is a standout even by the high standards of the work he did for TSR. That cover features (naturally enough), an altar/shrine/temple with lovely Frazettaish gracenotes. 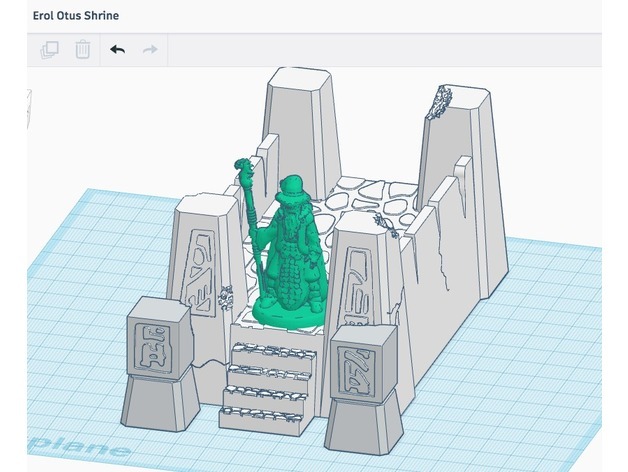 Jim Pacek has replicated that shrine as a 3D-printable STL file on Thingiverse, which can be printed at 28mm scale, perfect for your D&D miniatures. He even printed and painted one. It's amazing.